I'll try to give my eyes more of a break from nerding out, so I won't be writing every day but weekly is pretty good. So, numbers! Finite state machines! My coffee is really cold! Let's get into it. My gripe with playMaker has mostly been my panels looking like a messy bowl of spaghetti. Especially if you're still trying out different solutions, messiness is I feel a part of it, a little. So despite my better judgment of resting I've created a money-system in the game, to test stuff out it increases with clicks, but eventually it becomes automated. 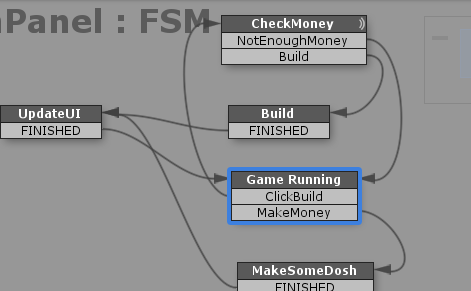 And it won't be "money" exactly, it's just better to create a clearer base if the variables are straightforward (though I can make some units generate spaghetti in honor of this visual scripting journey). So the point now is making currency and materials automated from fighting aliens and different ones will be needed to make different buildings (just duplicating the existing system with different currencies). I need a visual representation of these buildings as well to make it easier, then a place where the player can have an overview of what kind of stuff they own. I'm forced to start thinking about the UI early, as inventory-managing is the name of the game so it needs to be intuitive and look snazzy as heck. I have my work cut out for me and I'll get to it tomorrow first thing unless the eye doctor tells me my eyes are allergic to Unity. Just kidding, I'd still do it. I might plan it in MagicaVoxel (good for some fast prototypes) and photoshop, since I have to also do some concept art of the aesthetic I want the first planet to have. It'll make it easier later to make some coherent art for the final stuff. I've already got a 5Gb space reference folder waiting for me with all the inspiration I need to fill out a solar system. So that's my this week's plan, mostly taking a break from staring at tangled spaghetti by drawing a lot of art. Wish me luck for my optician's appointment tomorrow. Peace out! I am aware of this problem, but i don't know if i am experiencing it. In the September, last year, i had a screen brightness of 50-60%, in last few months i had it at 20-40%. Since January my screen brightness is almost always set to 0%. I am not experiencing any kind of eyesight problems or difficulties.. but should i be worried too? Could you ask him this kind of question? I would really appreciate his answer. Good luck at your optician's appointment, Jane. It's not a problem, guess i will need to. Thank you for the heads up. I love your heading and intro. Best wishes with your optician' visit. Haha, thank you, glad you enjoyed it!